Malifaux - A brief history. Whether whispered in the rumors of the general populace or spoken in the secretive, hushed tones of the Guild, it is a word always invoked with fear. For years mankind had grappled with the evident decline of magic. Even the greatest of practitioners found it increasingly difficult to perform the most basic of spells. Some argued that we had become too dependent on magic; that we should welcome a more mundane state. On the other side of the debate it was pointed out that practitioners of magic, especially those whose talents were in the healing arts, improved the quality of life for everyone. In 1787, the most powerful practitioners of the day came together and united themselves in the pursuit of new sources of power. Although the process of how they discovered a new power is still a closely guarded secret, they found a world just outside of our existence, separated from this world by a thin barrier - a barrier that they could perhaps open. The raw magical energy that emanated through this barrier was too tempting to resist. In an unprecedented move - some would say an act of desperation - the magicians worked their greatest magic and tore a hole through this barrier between the two worlds. The destruction resulting from the aetheric feedback was massive. Many of the weaker practitioners participating in the ritual fell lifeless instantly. Other, more powerful, magicians felt their magical capabilities stripped from them as the hole - the Breach - tore open. The city surrounding the ritual site was flattened, the life force of its inhabitants ripped from their bodies as aetheric equilibrium was established between the two worlds. Those that survived found their powers increased many fold simply from their proximity to The Breach. They say that every great deed requires a great sacrifice; both were accomplished that fateful day. It was officially called The Breach of The Great Boundary by the magicians - the Breach to everyone else. A ragged hole torn from the very fabric of reality itself, the darkened tunnel extended ninety feet wide, sixty feet into the air, its surface shimmering like a mirage in the heat. A cold wind blew through the Breach and brought with it the faint smell of ancient death. Exploratory teams were quickly gathered to scout this new land and bring back some of its secrets. On the other side of the Breach these teams found a large city. It was surprisingly similar to many of our own on the surface. However, those that crossed the Breach that fateful day could tell this new world was vastly different as well. Many of the buildings bore strange writing, some carved into the brick facades, others painted onto wooden doors. After searching the City for two weeks, not a single living thing was found, not a trace of human or animal. With no signs of battle: no corpses, no destruction, it was as if the inhabitants had simply disappeared. Many learned scholars at that time were allowed entrance to this strange new world to study the signs and symbols in an effort to learn what may have happened to the residents. After months of research, they learned that the City had been called Malifaux. The signs and symbols on the bricks and doorways were simple store signs: merchant, tailor, blacksmith. Other signs, though, seemed puzzling; for example, Death Surgeon and Mechanical Magics were but two of the oddly titled storefronts the explorers and scholars were able to translate. Throughout these explorations, no records could be found that gave any indication of what had befallen the previous citizens. The explorers moved farther out, seeking answers, but also seeking the source of the aetheric power they felt around them. Several miles from the City, they found a small settlement that could only be a mining town. There were a few wooden buildings, many of them crumbling. They discovered a large hole cut into the hillside just west of the town with a shaft leading down. Their explorations soon turned up a gemlike substance that radiated aether - the magical energy this world seemed awash in and that Earth desperately needed. The stones came in a variety of shades of white, some more powerful than others, but within them there seemed to be a store of latent magical energy a magician could easily tap for his own purposes. The scholars found references to these magical stones in old manuscripts. The manuscripts spoke of great power within them, but also great danger. The practitioners didn't care about any danger; they wanted power. There was a rush to harvest these stones in great quantity as magicians of all skill and specialty could possibly use them to power their magic. Those working with the stones also noticed an unusual effect - as they tapped into a stone's power it grew dark, as its magical energy was gradually depleted. Eventually, and purely by accident, it was discovered that a stone's magical energy could be replenished when it was brought into close proximity of a dying person. This curious effect earned the stones their popular nickname - Soulstones. After six months of exploration, the Breach was opened to the general populace. A thriving trade was established Earthside for those daring enough to harvest Soulstones. 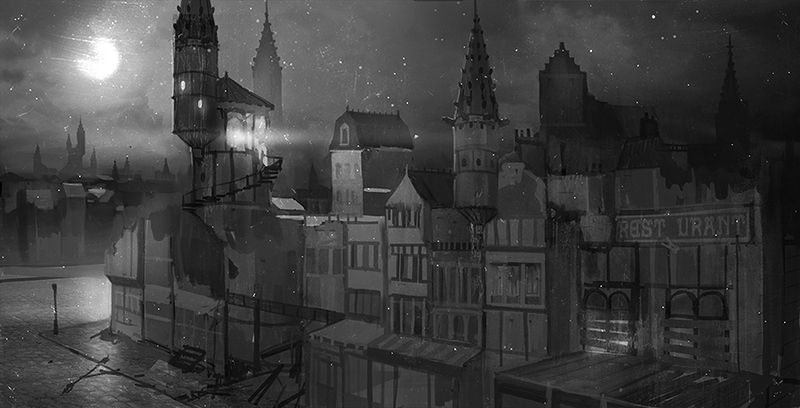 The crumbling boomtowns away from the City of Malifaux were rebuilt, and those willing to brave the harsh environment populated these cities to work the Soulstone mines. Many magicians moved to Malifaux in order to study this new world's unusual magic, and with them came families and servants - an entire population. Life in Malifaux continued in this fashion for little more than a decade. The salvation of magic was at hand. The human inhabited areas of Malifaux thrived over the next decade, growing fat and rich with the harvesting and trading of Soulstones. As settlements were established farther from the Breach exploration teams were sent deeper into wilderness, but few returned. Those that did talked about encounters with fantastic creatures resembling myths and fables from Earth's past. The explorers dubbed them the Neverborn. None knew why they had waited before showing themselves, but the Neverborn quickly made it clear that man was no friend of theirs. The inherent dangers which came with settling a new world were now amplified by the threat of hostile natives along the ragged border humanity had scraped into Malifaux. Even with the Neverborn threat ambitious men and women continued their explorations. Tales began to circulate about explorers uncovering tombs containing a dark secret. The first explorers to uncover the secret took it to the afterlife as the tomb's guardians, dead for centuries, rose up to slay them. Other explorers were more fortunate. These encounters proved the magical theory of necromancy was sound. Until this discovery the black art was just a faerie tale Earthside, but in Malifaux it was a reality. Opportunistic magicians studied the explorers' findings, searching for more information about this new brand of magic. Many were killed by the things they resurrected, while others found the means by which they could use the dead as drones or slaves. The most powerful of these dark magicians turned their necromantic lessons toward the manipulation of dead flesh, turning a human corpse into a horrible abomination. Feared and hunted by other settlers, these Resurrectionists were forced to hide their experiments from sight, retreating into the darkest corners of Malifaux. Other magicians focused their studies on the fantastic machines discovered throughout the City and beyond. Although many of the devices found had succumbed to the ravages of time, the few which had survived required the energy from a Soulstone to power their metal forms. Many of the machines were simple things, little more than toys. However, some were far more complex, with applications neither magicians nor mundane engineers could easily discern. In this way a decade in Malifaux passed, the promise of incredible discoveries and threat of overwhelming danger playing on mankind's ambitions and fears in equal proportions - that is, until the winter of 1797. During that winter a terrible blizzard struck the City and with it an instability in the Great Boundary. Despite the best efforts of magicians on either side of the Boundary the Breach began to shrink in upon itself. Attempts to enter the Breach from either side were rebuffed, as if some outside force was preventing access through the barrier. Worse yet, sounds of a fierce battle drifted across the Boundary from Malifaux. In the early morning hours of the following day, despite all efforts to prevent its collapse, the Breach had shrunk to the mere twelve feet in diameter. A choking smoke rolled through it from Malifaux but those Earthside could still not pass through. The screaming and sounds of battle had grown silent as the night had worn on and fear clenched at the souls of the group assembled before it as they waited for the inevitable. More than one heart skipped a beat when without warning a mangled body came hurtling through the opening, landing with a sickening squelch moments before the Breach of The Great Boundary closed in upon itself with an ear-bleeding howl. Everyone's eyes shifted from the void where the Breach had stood to the corpse at their feet. Carved into its ruined torso was a single, ominous word: Ours. A time of shock and turmoil followed after the fall of the Great Boundary. Every effort was made to reopen the Breach, but without success. Soulstones were also used to power the most aetheric-intensive rituals attempted, destroying these now precious resources. Soulstone. Depraved acts were even enacted in an effort to capture life forces in artificial Soulstones, but only met with failure. The turmoil these acts created gave the confederacy of magicians that had originally opened the Breach the opportunity they needed to come together and be recognized as an official political entity. And with that, the Guild was formed. The Guild took control of access to Soulstones, doling them out for use in exchange for positions of power within each government. Minister of Magic, Secretary of Aetheric Practice, and so forth, these titles gave legitimacy to their claims. The Guild demanded they be put in charge of the area surrounding the Breach to further study the phenomenon and how they may be able to open it again. The Guild also instituted measures to ensure facilities were available where their members had access to departing souls with which to recharge their Soulstones. Society had become too dependent upon the Guild's magical influence to let its power diminish. Soulstones were routinely renewed at hospitals, prison, and facilities that housed the elderly. Although seen as cruel by some and generating countless hours of moral and religious debate, many saw the practice as necessary to preserve the benefits magic brought to Earth. Exactly one century after it had closed, down to the exact minute, the Great Boundary unexpectedly tore open the veil separating Earth from Malifaux once again. Unlike the first breaching, the death and damage the Breach's reappearance caused was relatively minor. The return of the Breach caused panic throughout the Guild, as they were certain that whatever calamity had befallen Malifaux a hundred years earlier was about to be played out Earthside. The Guild mobilized its military arm, prepared to turn back any threat which crossed through the Breach. After a month of intense battle readiness, the Breach remained undisturbed. Satisfied no immediate peril had presented itself yet the Guild sent a heavily armed exploratory group through the Breach to Malifaux. They found the City empty and partially in ruin, evidence of a fierce battle scarring nearly everything around them. Much of the damage was old, but signs of a more recent struggle could be seen as well. More disturbing than the rubble was the complete lack of bodies, living or dead. With such widespread destruction the explorers anticipated discovering hundreds of corpses, but felt their dread increase with each empty block they searched. The Guild moved quickly, establishing a reinforced beach head Breachside. They knew they had to solidify their claim to Malifaux and manipulate the general populace's emotions into believing it was in their best interest to let magicians govern traffic through the Breach. The fact that those who would benefit directly from the flow of the Soulstones was an inconvenient fact the Guild downplayed whenever it came to light. Magicians lured by the tales their teachers had told them about Malifaux's wonders quickly demanded access, arrogantly believing they could handle any dangers they might encounter. The loss of so many valuable minds and magical talents when the Breach first closed was a valuable lesson to the Guild on how best to restore a colony in Malifaux if the opportunity ever presented itself again. This time, the Guild instituted a practice where the hardest criminals and other social undesirables were given a choice: serve out their terms of incarceration in Malifaux, possibly earning their freedom through hard labor; or face the Earthside sentence for their crimes, often a lifetime in prison or execution. Many of these “lifers” accepted the Malifaux sentence and traveled through the Breach to work the Guild's mines and aid in reestablishing humanity's claim to the new world. Naturally, where limitless opportunities exist, so do individuals who are willing to face the unknown, no matter how great the danger may be. Seizing on this desperation, the Guild instituted a contract system whereby these individuals were brought to Malifaux and permitted to pursue their fortunes, with a portion of their successes going to the Guild's coffers. With a work force mainly comprised of opportunists, debtors, social undesirables, and criminals the Guild put a governing force in place to watch over its misfit collection of labor and settlers and ensure recovery of Soulstones continued. Life was and is harsh in Malifaux. Those who buck the system or attempt to interfere with the flow of the Guild's precious ‘stones, it is also short. Despite the Guild's iron rule, however, there are those who are able to garner enough power or wealth to rise above its reach and carve out a life they never could have Earthside. Every man, woman, and child in Malifaux strives for this - power to live their lives unmolested, or to buy a return trip home and live comfortably back Earthside. Four years have passed since the reappearance of the Breach. Much to the Guild's displeasure, reports of other, unstable Breaches continue, threatening its monopoly over traffic between the two worlds. While none are as large as the main Breach, the Guild is now faced with having to compete with other interests outside their control over the supply of Soulstones to Earth, not to mention discovery of rare artifacts and magical lore continually recovered by explorers and pioneers reaching further and further into Malifaux's wilderness. bulwarks; many of them cutting across streets and alleys in an attempt to restrict access to - and from - the human settled Zones. The Governor General's military arm, the Guard, oversees the peace within the City under the auspices of protecting its inhabitants - often with an overeager zeal the residents would call oppressive. Beyond the City's walls the Guild's influence is weaker. It maintains Guardsmen in key strategic locations, as well as anywhere the rail lines run. Otherwise it only takes an interest in boomtowns and pioneer towns that hold something of value. The Governor General has the authority to issue writs which give the leadership of these settlements limited power to enforce Guild laws in the Guild's name. These writs also provide the leadership with reasonable Guild resources and support in exchange for Guild loyalty and a hefty tax levied monthly. As the Governor General's influence and resources are stretched by the Guild's constantly-expanding border other groups have begun to solidify their power bases in Malifaux. The most well-known of these groups are the Arcanists, whose goal is to depose the Guild and its control of Malifaux. While some believe the Arcanists work toward a greater good, their manipulations will ensure they will control the Soulstone trade, finally wresting it from the Guild's hands. The atmosphere of violence has thickened within the last year and more than one skirmish has occurred between competing factions as well as with the Guild itself. To make matters worse, the Neverborn have resurfaced as they seek to cull a human herd for their own pleasures. What their ultimate goals are and whether or not they were responsible for the loss of the original colonists or the re-opening of the Breach remains a mystery. The only certain thing is that they have once again shown themselves to be a threat to all humans this side of the Breach. And with the reopening of the Breach comes a return of the Resurrectionist threat. Coming through the Breach in the guise of contractors or settlers these necromancers have returned to plunder Malifaux to further their limited knowledge of raising the dead. Despite the Guild's declaration that necromancy a crime, and announced a bounty on all Resurrectionists it seems the ranks of the undead rise daily and the Guild fears it is only a matter of time before the risen dead outnumber the living in Malifaux. Along with the scramble to recover Soulstones, recent discoveries of powerful artifacts have brought a new interest from the various powers throughout Malifaux. However, any attempt at retrieving these artifacts quickly attracts the attention of the Neverborn, and it is only the truly strong, or the very lucky, that manage to retain control of any of these items for long. In an effort to maintain its control in the face of these myriad challenges the Guild has stepped up its already cruel and heavy-handed authority, reasserting its control over Malifaux violently and fatally when necessary.